This is the end of our second full week in Mission, where we will be until near the end of March. We had a rather relaxing week —which I guess is the whole idea of being here! The after-Thanksgiving arrivals are rolling in. Most park activities have begun. In fact, last night the first jam session of the season took place at our clubhouse. It’s an every-Friday event, through March. We have a house band of seven musicians and up to 40 individual jammers who come to perform for the rest of us. I’m an assistant audio technician so help set up and tear down the mics and sometimes operate the audio mixing board. Wednesday, our friends from Port Aransas flew down in their little red airplane. 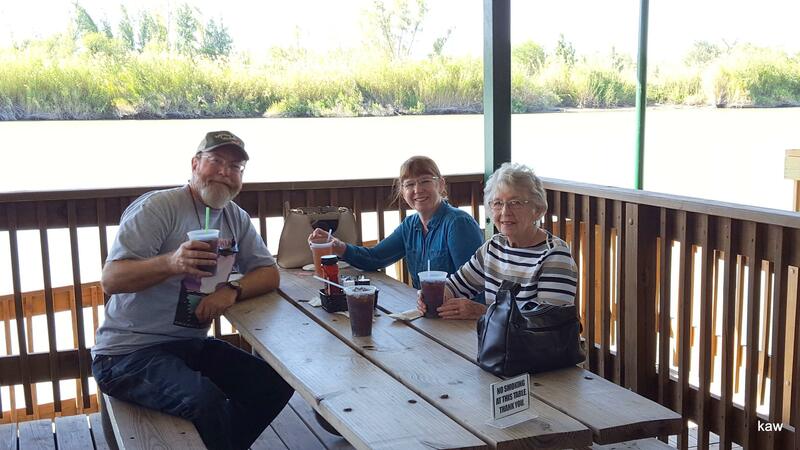 We had lunch at Riverside Club, which is right on the bank of the Rio Grand River. In the picture above, the brush in the background is in Mexico! That day, there was little traffic on the river. We only saw two Border Patrol boats and no north-bound swimmers. Riverside Club serves the largest tenderloins I’ve ever seen! I ate what I could of mine, then brought the rest of it home. The leftovers made another meal for both of us! 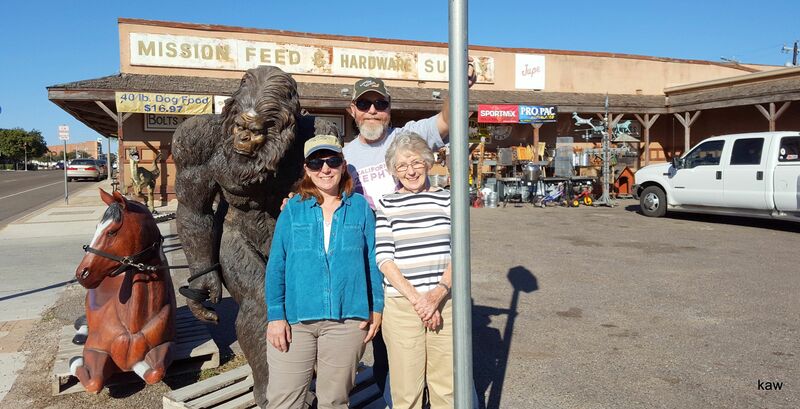 We had a little time before they needed to get back to their plane (they prefer to be home before dark) so we stopped by the Mission Feed & Hardware Supply Co. It’s a very unique store, to say the least! Want to buy some baby chicks? Come to this store! One day of this week in Mission the temperature hit 99º, breaking the record for the date by 9°! That’s a bit hot for us, especially when it is a bit humid, as it was that day.